California’s drought drags on. To that end, I’ve planned my seedy business judiciously. 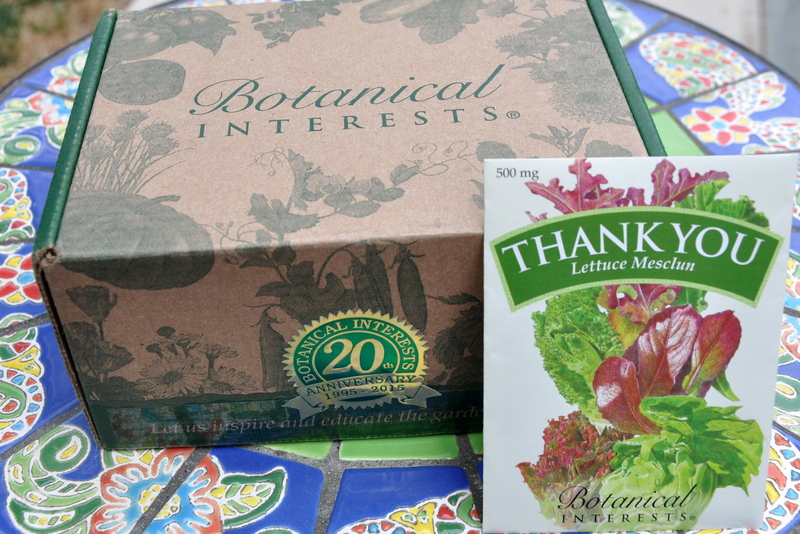 About two weeks ago, this sweet little box of seeds arrived in the mail, my modest order from Botanical Interests. They even included “thank you lettuce.” You don’t see that ever day. When I first starting buying seeds, I didn’t pay much attention to the source. Now that I’m better educated, I prefer buying organic where possible, while supporting small, independent companies. This hardworking combination of field peas and hulled oats is a legume and grass cover crop that quickly benefits the soil with nutrients and green matter, while helping suppress weeds. A great cover crop for established gardens, the mix is also perfect for improving areas being turned into gardens such as lawns and vacant lots. Pea plants fix nitrogen and condition the topsoil while the pea flowers attract bees and other beneficial insects. As an added benefit the young pea shoots and tendrils are edible and can be used in salads or as a soup topping. Oats hold nitrogen, provide green matter and provide support for the pea vines. Not bad for $2.99 a packet! I bought three. This is my only cool-season crop. I’ve grown it before and it got by on very little watering. I’m hoping for the same success to keep my water usage low. After reading earlier this year about the decline in butterfly populations, I learned that one of the problems is the reduction in Milkweed. I’ve never seen it offered in our nursery centers, but found the seeds online. It’s a perennial, and will replace the seasonal flowers I’ve grown for the past two years in the triangle near our front sidewalk. The plant prefers swampy conditions, but they say it will do okay with ‘regular’ garden watering. I’m trying not to get my hopes up, since San Jose is anything but swampy. I’ll be thrilled, though, if I can plant a healthy shrub that attracts Monarch’s and helps them on their way south. 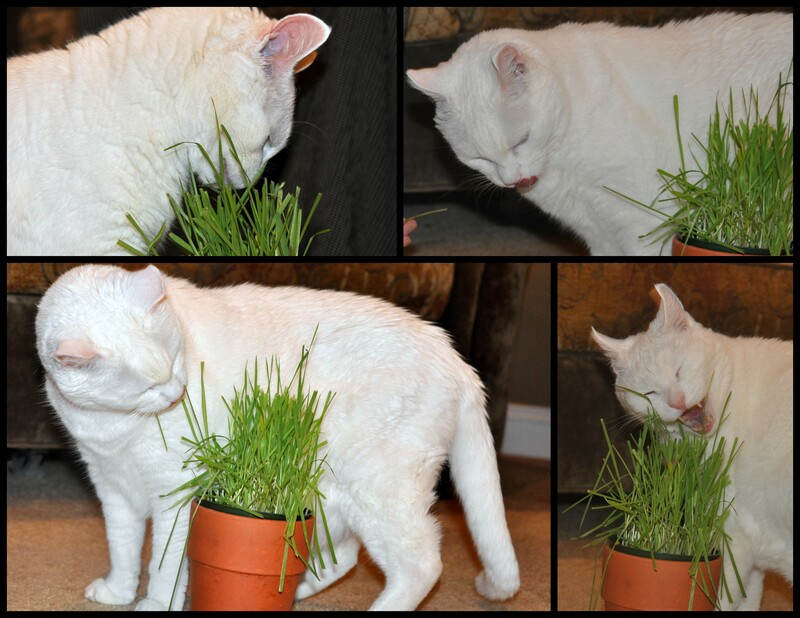 My sister’s indoor kitty, KT loves his greens. He prefers home-grown to what’s available at the market and I can grow it for a song year round. Pretty cool, eh? So I plant a pot every few weeks and place it near the kitchen window. My sister brings me the empty pot, and I start a new batch so we always have them in rotation. I tried to get Mr. Personality to pose for these pictures, but we wasn’t having any of it. 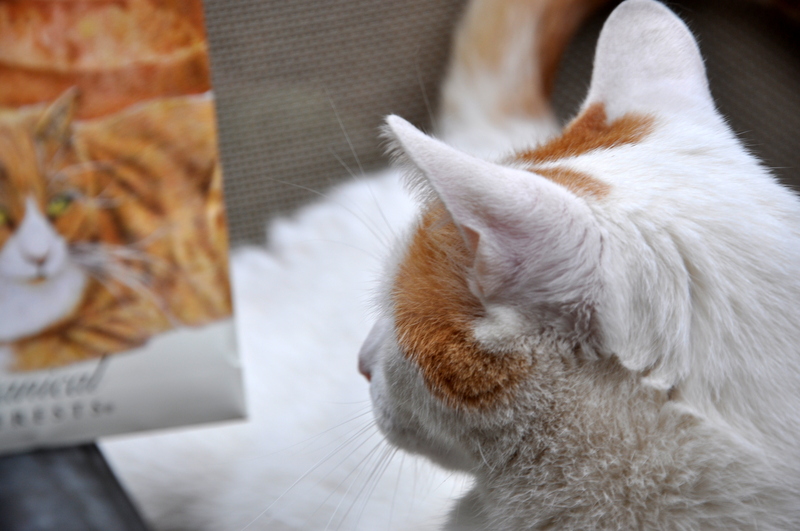 He eventually nibbled on the corner of the envelope, before jumping down and moving on. Here is the lovely KT moving in for a nibble. Isn’t he the sweetest? KT started out as a foster cat, but she couldn’t let him go. So, that’s my seedy business this fall. How about you? Are you dropping a seed or two into the earth, a greenhouse, or the time-honored pot in the windowsill? 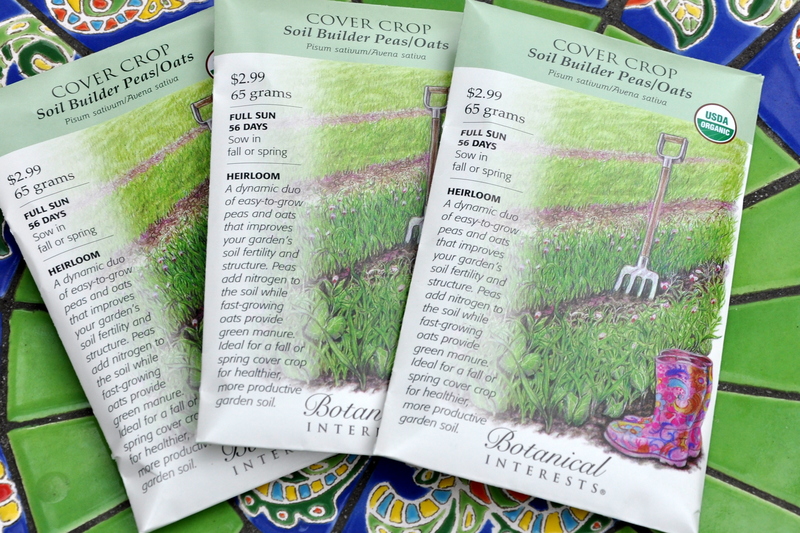 This entry was posted in Gardening, Seeds and tagged Botanical Interests, Botanical Interests seeds, broccoli from seed, Butterflies, cats in the garden, cover crop, cover crop seeds, growing cat grass, milkweed, planting seeds, soil builder oats, Soil builder peas. Bookmark the permalink. A post with Mouse is so fun, just what I needed tonight. He’s kissable looking and aloof at the same time. If that’s possible. I’ve climbed into bed to rest, obviously I’m out of wack today. I still can’t believe I missed Skype, scheduled for a month with a reminder to boot. I can’t even imagine where my head is at. I bet it was a riot. I’m so sorry to have missed it. 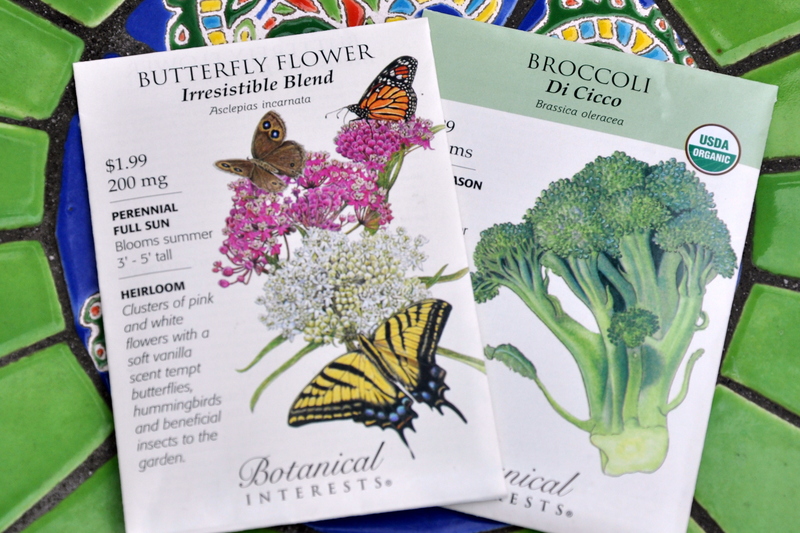 I’m loving the illustrations on the seed packets.Very pretty and inviting. Even the delivery box seems like a treasure. What a great thing to receive in the mail. I see all kinds of things I’d love to order on the net, but when the shipping is calculated to Canada it’s dreadful. I think on-line shopping is so great in America. I should love to try milkweed too, but I also want to keep watering to a minimum. I have already got some seed for flowers for next spring, but will probably be tempted by all the special offers over winter and have far too much again! Good luck with the broccoli. Oh and Kitty is so sweet! I too end up with more seeds than I know what to do with. Two years ago I made cards to go with my Cosmo seeds and gave them to a friends at Christmas (or at least friends that like to garden). It was fun. 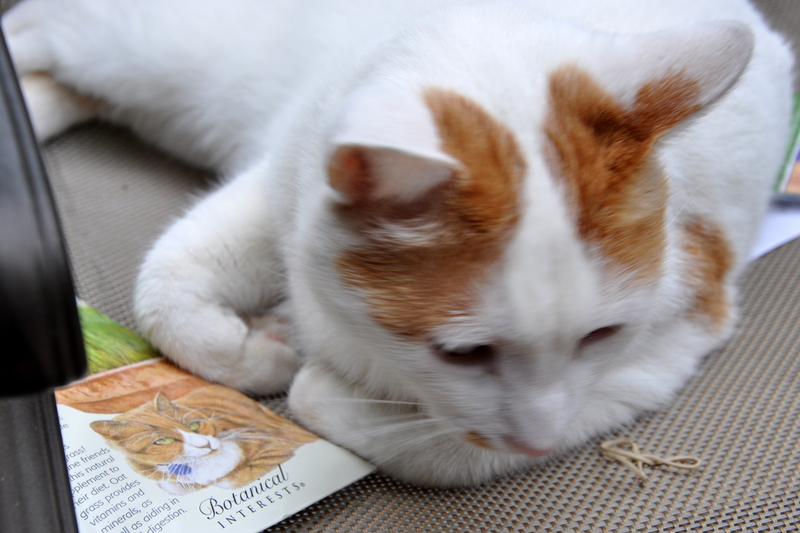 I also take starts and seeds to my Pilates class and share there. My best sharing story, however, is the year I gave a handful of pumpkin seeds to a pair of 3-year-old twins. They planted them with their dad and they grew! So cool. Coincidently I’m just off to the greenhouse to sow some winter salad leaves and flowers for next year. Broccoli is a great winter crop as once you’ve eaten the large main head it carries on producing crops of smaller heads, just right for risotto etc. It usually goes all through the winter for me. Thanks for the tips. I’ve grown it twice with mixed success. The first year we had an early spring and it bolted. The second time it did okay but not great. I think I had a problem with pests. Since we eat broccoli several days a week, it would be wonderful to have our own crop. We shall see. Thanks for cheering me on. Best of luck with your green house plantings. Good idea to support the small, independent seed suppliers. It will be interesting to see how your plants fare with less than swampy conditions! I know. I’m forever hopeful. I am very interested in the results of your cover crop! Sounds really interesting and pretty at the same time.